Waking Maya is a thrilling quest to understand the deepest principles of our reality. Millions of people worldwide are fascinated by practical metaphysics such as The Law of Attraction, which posits that focused thought and intention can influence the events of our lives. Waking Maya goes further, exploring these wisdom teachings as they relate not only to personal but to cultural change, dramatizing how the beliefs held by groups of people have brought about the transformative changes that have shaped human culture: the rise of the global village, democracy, the Enlightenment, the Renaissance, the spread of religious belief, and even wars. These may not be arbitrary paradigm shifts, but directed changes originating deep within the collective human mind as it attempts new ways to discover and explore its potentials. Waking Maya, the story of a young woman’s quest to find her father, peels back the many layers of this theory in the context of a heartfelt search for meaning and identity. Trapped in a wasteland suburbia, 22-year-old Maya hopes to find the light yet doesn’t know where to look for it. The mystical dimension comes calling in the form of her father’s journal, written in seeming anticipation of her arrival at its hidden burial site. Following its instructions, Maya’s world shifts. Inspired to find him, she sets off on a cross-country journey of discovery. As it progresses, she is thrust deeper and deeper down a rabbit hole of secret societies, ancient wisdom and extraordinary phenomena. 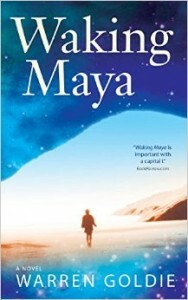 Waking Maya has the power to change beliefs, skillfully building its theory in a page-turning narrative. At its core, this novel is a probing examination about why the events of our lives occur as they do. Its disruptive teaching is woven throughout seamlessly, so the reader is hardly aware of the tectonic shifting of beliefs that is occurring. Journey with Maya on a thrilling quest to understand the deepest principles of our reality.